Teenagers today are difficult to impress because of...well...everything. Thanks to technology, they have the world at their fingertips and can connect to anyone and watch most anything whenever they want. Things were much, much different in the 80s. Despite the fact that cable television opened up the world of entertainment possibilities and home video gave the viewer the choice of when to watch a movie, things were still very limited when compared to modern times. Therefore, even a movie which was only slightly exciting would seem like a cinematic feast. However, when viewed today, some of these movies don't pack the same punch. Let's see how 1984's C.H.U.D. come across when viewed in 2016. C.H.U.D. takes place in the seedier side of New York City. Captain Bosch (Christopher Curry) of the NYPD is investigating a series of disappearances. He approaches A.J. "The Reverend" Shepherd (Daniel Stern), who runs a soup kitchen, for information, and learns that the local homeless have been fleeing the underground tunnels out of fear. Meanwhile, photo-journalist George Cooper (John Heard) has been involved in a project where he documents those living in the subway tunnels. Some of his subjects report strange injuries. As these men look further into these incidents, it becomes clear that something dangerous is lurking beneath the streets of the city and it's feasting on people. The early 1980s was a heyday for independent horror films in the United States, and these movies basically fell into two categories -- those which were obvious copycats (I'm looking at you, slasher movies) and those which did something to try and stand out from the crowd. C.H.U.D. falls into that second category and it should be quite obvious that it's the film's title which gives it a different vibe. You see the name and you immediately think, "C.H.U.D.? What the heck does that mean?" The fact that it's clearly an acronym implies that it's more than just a made-up word and the guttural sound of "chud" is primitive and intriguing. And then you have the promotional poster which had a mist-enshrouded creature emerging from a sewer. What is this all about? Well, you are unfortunately going to have to wait a long time to find out. The film falls into a trap which has ensnared many a horror movie over the years -- it becomes a police procedural instead of a monster movie. We watch the various characters attempt to find out what is happening, instead of the movie actually showing what is happening. There are a lot of scenes of Bosch and Shepherd arguing or Cooper wandering when we came here to see a creature-feature. Now, I understand that with a budget of a little over $1 million and a desire to keep in the monsters in the shadows as long as possible, we weren't going to get wall-to-wall action here, but it takes a long time for the creatures to finally appear in full. 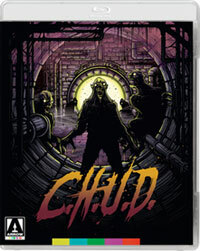 The movie is far more interested in tantalizing the audience with the true meaning of C.H.U.D.. Really? This isn't Boggle. And the finale is very reminiscent of Alligator, which had come out four years earlier. While teenaged me remembers being impressed with C.H.U.D., adult me was completely underwhelmed by the movie. I had not seen this movie for many, many years, and while I accurately remembered the interesting look of the monsters, the movie in my mind had a lot more action. Instead, what we get is the typical 80s horror movie which is all talk, no excitement. Again, the monsters look great, which I think is why some horror fans have a fondness for this movie. And while the ecological plot was (and is) certainly timely, that doesn't necessarily make for a good scary movie. So, in the end, we have a film with a weird name. It's cool that it's been referenced in things like The Simpsons, but I wish that the real movie had been as good as the one in my teenaged memories. C.H.U.D. is a little vague when it comes to its scientific facts courtesy on Blu-ray Disc courtesy of Arrow Video. The film has been letterboxed at 1.85:1 and the Disc contains an AVC 1080p HD transfer which runs at an average of 30 Mbps. The image is sharp, but it does show a slight amount of grain throughout. There are no overt defects from the source materials. The picture is somewhat dark and the colors are slightly drab. The level of detail is good, as the image is rarely soft, but the picture does lean towards being flat. The Disc carries a Linear PCM Mono audio track which runs at 48 kHz and a constant 1.5 Mbps. The track delivers clear dialogue and sound effects. As one can imagine, we don't get any speaker-busting audio effects here, but the actors are always intelligible and the film's score sounds fine. Yet, one can't help but wonder how the finale would have sounded in 5.1. The C.H.U.D. Blu-ray Disc contains several extra features. We begin with an AUDIO COMMENTARY from John Heard, Daniel Stern, Christopher Curry, Director Douglas Cheek, and Writer Shep Abbott. Another audio track has an interview with Composer Cooper Hughes. "A Dirty Look" (19 minutes) is an interview with Production Designer William Blowit. Special effects make up artist John Caglione Jr. is featured in "Dweller Designs" (12 minutes). "Notes from Above Ground" (9 minutes) has Michael Gingold and Ted Goeghegan tour some of the New York City locations from the film. A "Behind-the-Scenes Gallery", one DELETED SCENE (1 minute) and a TRAILER round out the extras.